Due to a happy quirk in scheduling, we had a few days off last week. 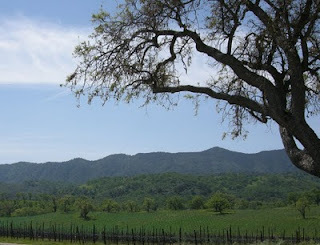 On a whim, we headed north to Paso Robles. Halfway between Los Angeles and San Francisco, Paso Robles is a wine growing area in the Central Coast Region of California. The landscape is simply stunning. There are rolling hills dotted with oaks, an occasional olive grove, walnuts & almonds, and abounding vineyards just starting to leaf. The winter rains have produced the most verdant hillsides we’ve seen. Coupled with brilliant blue skies, the setting took our breath away. You get a touch of the Piedmonte, a bit of Burgundy, and a little of the Rhone Valley if it wound through Tuscany. When we weren’t meeting with winemakers, we were sampling some amazing restaurants. Here goes with the first of several food reports. We’ll get to the wine in a few days. On the drive up we stopped in Santa Barbara for an amazing lunch at La Super-Rica Tacqueria, the well-known taco stand that was a favorite of Julia Child. We sampled tacos of house-made chorizo and adobado (marinated pork) in handmade tortillas. The highlight was the special of the day was a Chile Relleno in a marvelous cream sauce (and a few extra of those amazing tortillas to sop up the sauce). Fortunately the line wasn’t too long and we were able to eat and get back on the road fairly quickly. Wine country was calling. Most of the restaurants in Paso Robles are on or near the town square, a charming tree-lined park surrounded by historic buildings. The first place we tried was Villa Creek. They have a great reputation and some stellar reviews. Even though we didn’t plan on a lengthy sit-down dinner we wanted to give the restaurant a try. The bar and patio were packed but we were able to squeeze into the last two seats. We started with the Shepherd’s Plate, a selection of cheese, house-made grilled sausage with a horseradish mustard cream, olives, and marcona almonds. Our waitress asked if we had seen the taco menu. This turned out to be the source of the huge crowd: Taco Tuesday. They featured a selection of tacos, all at $2.50 a pop. Even though we were looking for more wine-friendly fare and had had a few great tacos for lunch, we felt we couldn’t leave without at least trying a couple. While they won’t put La Super-Rica to shame, the grilled shrimp, carne asada, and carnitas were all great. The shrimp was a standout. We’ll definitely return for a more complete dinner on our next visit. After this eclectic assortment we were ready for a stroll and on to our next destination: Il Cortile. is a new Italian restaurant in Paso, featuring some of the best Italian this side of the Atlantic. Chef Santos MacDonal is in the kitchen and his wife Carole runs the front of the house. The pastas are made fresh and daily specials are based on what’s available from the farmer’s market. The wine list combines selections from Italy with local wines from the Central Coast. You enter down a long exterior corridor that passes by an intimate, partially-enclosed, courtyard (hence the name Il Cortile). There's a small bar just inside the door. The dining room is paneled in warm wood, with a banquette along one wall. Eight to ten tables are laid out over the seating area. A large window looks our from the kitchen. Since we were just going to share a couple of smaller plates we chose to once again sit at the bar. We started with the housemade gnocchi with a gongonzola cream sauce and fresh arugula. The gnocchi were like little pillows and had the texture of clouds. We've made our own gnocchi many times and rarely has restaurant gnocchi approached our own. This very nearly surpassed it. The sauce was delicate with cream smoothing out the gorgonzola. The arugula added a bit of pepper and nicely balanced the creaminess of the sauce. Our Sangiovese from Pianetta paired perfectly. One of the most interesting stops on the exceptional menu is the Mozzarella section - 5 appetizers all with fresh burrata. We chose the Crostini con Burrata, toasted bread points topped with burrata, caramelized onion, and pancetta. The sweet, buttery, and salty all working together for a great - if slightly out of sequence - finish to a great day of eating.